Look for the dead pig in the window. I promise it’s the only one on this street. We’ve been saving Friends of Ham for a special occasion, and this is it. You’re reading Leeds Beer Quest’s 100th review! 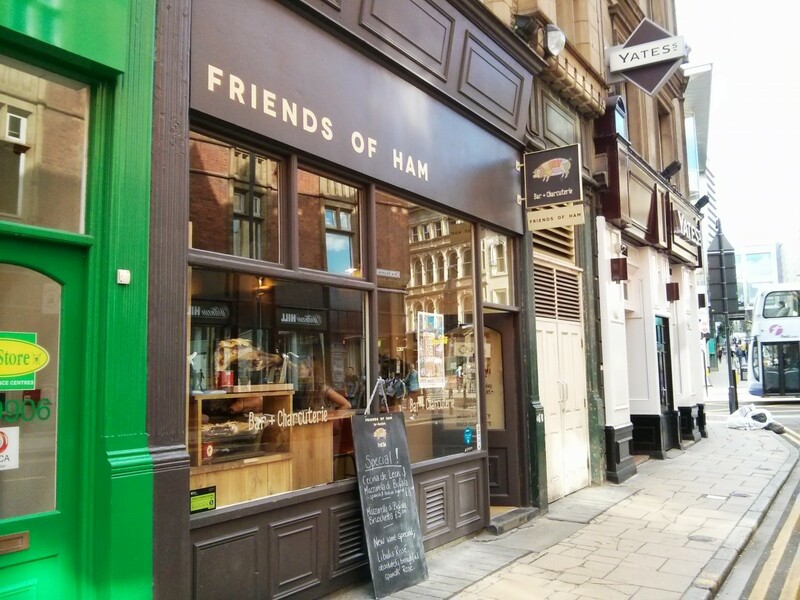 Friends of Ham describes itself as a bar + charcuterie, and this is immediately evident by the chunks of dead animal hanging in the window. 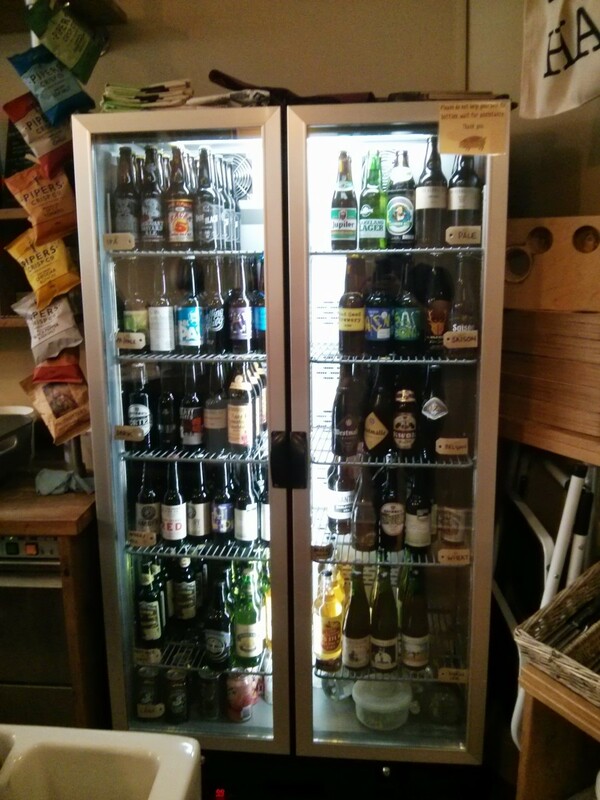 They pride themselves on providing only the best in cured meat, cheese, wine and craft beer. The upstairs bar area is always busy. I don’t know much about the other three, but their beer selection is amazing. You get a smaller choice than somewhere like North Bar, but it’s not the worse for it. 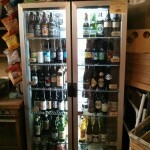 There are 3 casks, 6 kegs and a carefully stocked fridge that’s organized by beer style. Not one of them is average or permanent — you’re looking at a showcase of the best craft brewers from the UK and around the world. Every single time we’ve been in there we’ve wanted to try pretty much everything on the bar and beyond (if only we could). The staff are all very knowledgable and are happy to help you decide if you become too overwhelmed! Don’t miss the perfectly organized fridge. 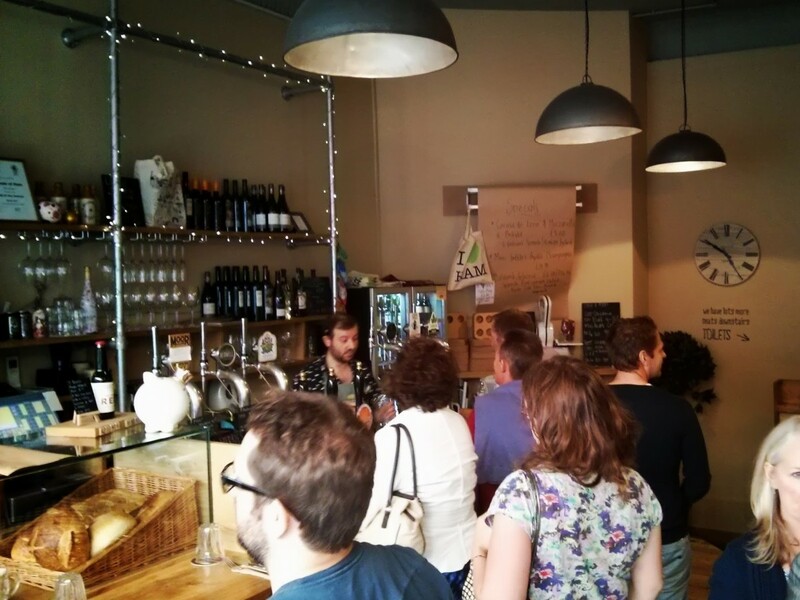 Friends of Ham are also friends of brewers, and every so often they have an amazing ticketed meet the brewer event with a favourite brewery (they’ve had Magic Rock, The Kernel and Wild Beer Co so far). This is a chance to try many unusual beers in a night and to actually meet and talk to the people behind them. The food here is also amazing, but don’t come for a full meal. These are small cold meat + cheese dishes for complementing your drink. Surprisingly for the name, there are a lot of vegetarian options! Downstairs there is a lot more space to enjoy your beer & cured pig-meat. The atmosphere is bright and open, despite the relatively small space. 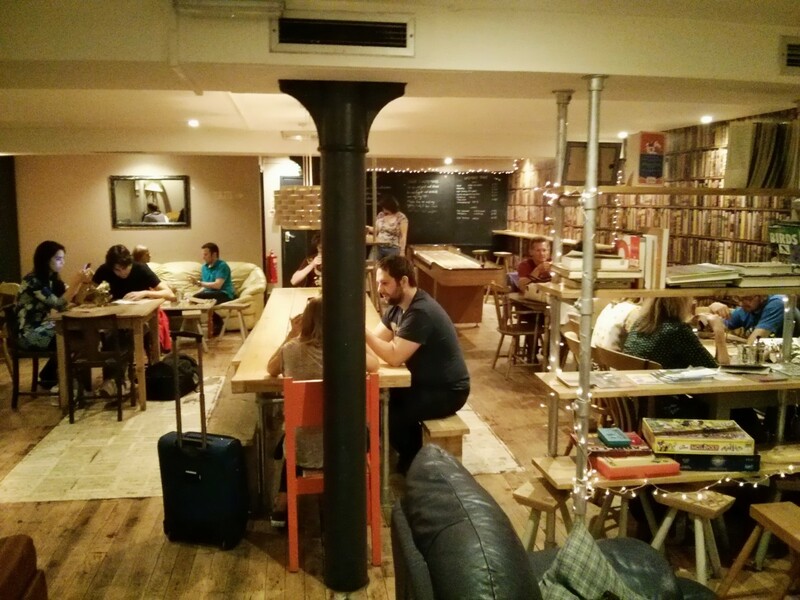 There are many different kinds of seating, including sofas and a giant communal table in the middle. 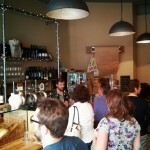 When it’s busy expect to sit on an uncomfortable bar stool, though (which are numerous)! 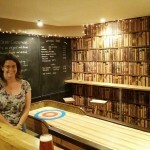 There are books (mostly about ham, cheese, beer and wine) and games here, including a vintage shuffleboard at the back. 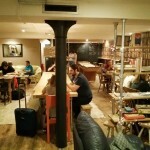 Due to its proximity to the station and its fame, there are inevitably a handful of loud suited types in here at very busy times but all the rest of the time it is a chilled out place that attracts mostly people who are prepared to pay a little extra for the quality of the beer and food. Emily & Shuffie the sentient shuffleboard. We’re not the first people to review Friends of Ham, of course, but we agree with what everyone else has said. This is a great addition to a city that really cares about great beer and the independent spirit, and in a year it has already become part of the furniture. Long live the pig! Sorry, but this one gets a low rating from me! 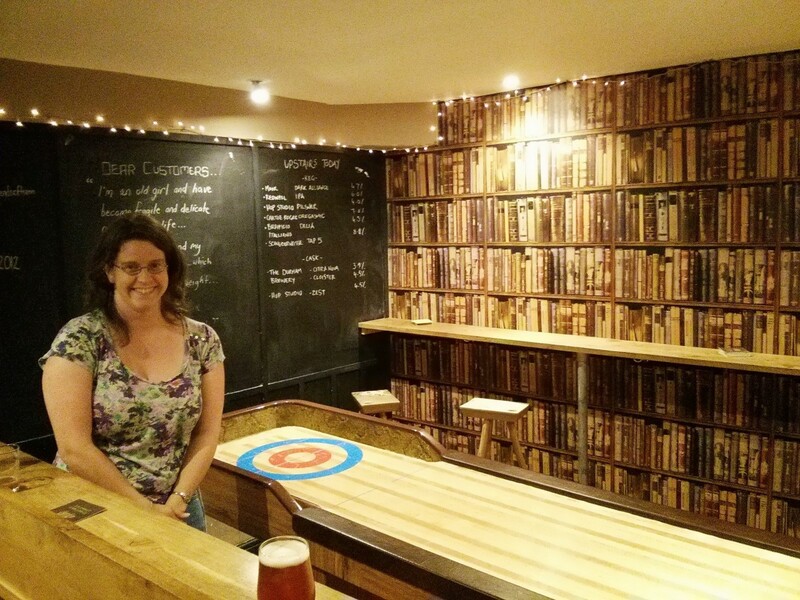 I like the beer and the book furniture but I don’t care for anything else about this bar. I really wanted to like it and have been twice now. There’s a lot they could have done differently to make this place more accessible. It would be better if the main bar were downstairs with table service upstairs for those who can’t manage the stairs. The situation as it currently is means at busy times you have people queuing up the stairs and crushing one another. The chairs and sofas provided look comfy, but are not comfy for anyone with lower back pain. Both times I have been were reasonably busy I guess, but it seems like it doesn’t take many people to make the bar a very noisy one. For anyone with hearing problems and for anyone prone to anxiety caused by crowding/over-stimulation of senses, this is a big problem. I think they might have done better to have divided up the space into smaller rooms and focussed the top floor on comfortable seating. However, one reason I dislike this place so much when I like Brewdog which is also pretty bad access-wise is the atmosphere. As soon as I step into it I feel unwelcome and that it’s basically a bar for people a lot posher than me. I find the food incredibly expensive and when I asked to know more about the food options (we didn’t know what some of the meats and cheeses were) a staff member was rude and made me feel stupid. I also spent a lot of time being pushed out of the way by other customers – there didn’t seem to be the usual pub etiquette along the lines of ‘No, you were here before me, no I insist…’ (A stupid ritual maybe but it pleases me). Even other busy bars seem to have a nicer atmosphere. I expect it’s nicer at a quieter time…But I don’t know how likely I am to find that out. 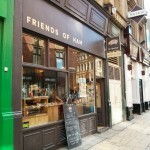 Pretty much the best bar in Leeds, what’s WRONG WITH YOU PEOPLE?!! Mediocre. The price of a pint buys you a half. Of ale. Not high % ale. Just an ale. The décor is so tragically aping Dalston and Brixton food/bar scenes it’s difficult to genuinely enjoy without the whole thing reeking of cynicism. It’s the sort of place that will tell you something ISNT available proudly. For instance- being told that a beer isn’t available in a pint. Err I think it is, you get a pint glass and fill it up, then charge me double the price. Friends of Ham is evidence that Leeds CAN have nice things, but then go and totally ruin it through greed, superficiality and insecurity.